The design team from Californian firm Feldman Architects are behind the conversion of the 1909 Bricca stables on Battery Street, San Francisco, now home to the offices of an investment bank. The design team from Californian firm Feldman Architects are behind the conversion of the 1909 Bricca stables on Battery Street, San Francisco, now home to the offices of an investment bank. A modern project in a historical space. Once upon a time in America… a historic stable in Embarcadero, on the east coast of San Francisco, a waterfront district constructed on reclaimed land along a just under 5-kilometre long engineered seawall, from which piers extend into the San Francisco Bay. For thirty years the Embarcadero Freeway dominated the area, dividing the waterfront from the city centre. After it was torn down in 1991, massive redevelopment began to make the area much more attractive. The development and restoration efforts have, according to the National Trust for Historic Preservation, “contributed to a remarkable urban waterfront renaissance”, with the Embarcadero Historic District serving as a “major economic engine for the Bay Area” (source Wikipedia). And here, on Battery Street, there was a stable, which from the time it was built in 1909 passed through the hands of many owners, one of those places where you’d love to hear what the walls had to say, if only they could talk. 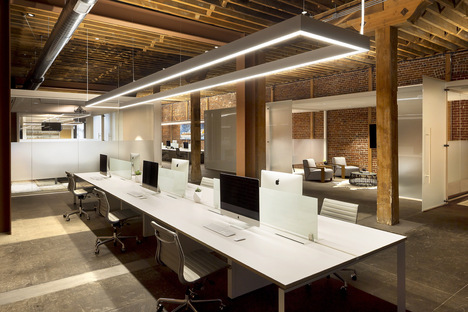 Now it is the headquarters of Scenic Advisement, a four-year-old start-up that is redefining investment banking for the private technology sector, which selected local firm Feldman Architects to create new offices in the bare bones of this historical structure. Considering the bank’s mission it was clear that an eclectic design intervention was called for in order to marry the new end use with the material charm of the building. The project by Feldman Architects is a total makeover of the 464-square-metre space but they retained a few references to the past, including the original brick and Douglas fir beams. They have succeeded in crafting an open, free-flowing space that includes communal zones like the lounge area and the open kitchen island, along with graffiti and street art on the walls. The fine furnishings are perfect for the single functions and at the same time, they give the workspace an inspiring ambience, as do its stand-out material characteristic. To provide an element of privacy, the architects introduced glass enclosures and glass partitions that allow natural light to reach into the depths of each individual compartment. Satin-etched glass, a romantic nod to the fog that rolls in from the Bay, absorbs and reflects the surrounding textures of wood and brick, camouflaging themselves into the rustic structure while offering an element of privacy to its occupants. At the same time, they are vaguely reminiscent of the old horse stalls. The work by Feldman Architects, known for their context-based approach, culminates in a space that reflects the history of San Francisco, and at the same time underscores the city’s modern evolution.